2018 was a season like Catboat Charters has never seen. It started with an overwhelming surprise win of Best Of The Vineyard 2018 and it ended with a Surprise of a very different nature…but we’ll get to that later. As we said, our season began, more or less, on June 7th at Farm Neck Golf Club with all of the other incredible nominees for Best Of The Vineyard 2018. Earlier in the year, when we found out that we were nominated, we were thrilled, but when we saw the calibre of the rest of the nominees—that really drove it home for us. There are so many incredible, hard-working people on this island. Winning that honor was a moment we will hold in our hearts for a long time. A new experience for sure. June continued and we were thrilled to be welcomed back by all of our old friends at Edgartown Harbor Master. Charlie, Will, Mike, and their amazing team do an incredible job. Edgartown is lucky to have you. The Catboat Charters team is grateful for everything you do. We’d also like to thank Edgartown Police, Fire First Responders, and The Edgartown Board of Selectman’s Office for keeping Edgartown safe and beautiful. The Old Port crew—Rick, Ryan, Doug, Dave, Elise, Chris, Bill, and Becca—tirelessly run us back and forth from Tigress to the harbor and always with a friendly smile. For that, we are grateful. 2018 also saw an, almost entirely, new crew aboard Tigress herself, and we think it was the best one to-date! Haleigh, Devon, Christina, and Carly did a great job supporting Captain Kurt and making sure all of our guests had a wonderful experience. We also want to give a huge shout out to Vineyard Vines for their continued support. Tigress had her second Vineyard Vines catalogue cover this fall! A real honor. 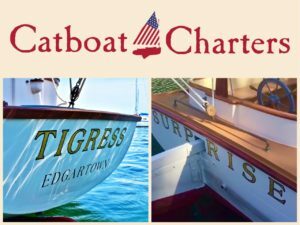 Catboat Charters is continually inspired by the way they represent the island community. A big part of our mission statement at Catboat Charters is insuring that we give back to the community. This year, with your help, we raised $4,160 for Martha’s Vineyard Community Services and $1,250 for The Derby Scholarship Fund! Our goal at the beginning of our 2018 season was to surpass our 2017 season’s donations—we did. We surpassed last year’s totals by $1,260!! We couldn’t be prouder of this fact or more grateful. We’ll have to work even harder next year! Captain Kurt would like to send out a very personal thank you to his father, Eric. Eric was instrumental in facilitating the installation of a new mast—well, borrowed, actually—on Tigress in the middle of August. Our Captain, in fact our entire team, couldn’t be more grateful to him. At the beginning of this post, we touched on the Surprise that wrapped our season. Well, that cat (get it?) is already out of the bag! The catboat ‘Surprise’ has joined our fleet and will sail the red, white, and blue, this winter to a—yet to be determined—southern location. ‘Surprise’ is the very generous Catboat that leant her mast to Tigress in her hour of need. She’s a beautiful girl and she is looking better than ever—mast back intact—thanks to the loving attention of Captain Kurt’s brother, Ryan Peterson. Thank you Ryan for all of your hard work! Stay tuned for more on Surprise in blog posts to follow! Most importantly, we would be dead in the water without the continued support of you—our guests. Your continued patronage means more to us than we can express in a blog. We’ve been around long enough now that we are seeing friends return year after year. That’s a very special experience indeed. As our business grows, so does our thank you list. If you’re lucky, that’s the way life goes. Every year, we meet more and more supportive people in and around the Martha’s Vineyard community. It’s a community like no other in our hearts and every day, we are grateful to be a part of it.